Aspire tell us they were absolutely delighted to benefit from funds raised at the 2018 Christmas Match Fund. They will use some of the money raised to provide additional, specialist employment support and advice to rough sleepers and people affected by homelessness in Oxfordshire. They will be able to run employment advice sessions at the hub in Bonn Square on a regular basis, which will include support with Universal Credit issues and claims. They can also offer work experience on Aspire's own social enterprise businesses as well as access to a welfare fund which will provide practical support such as training, essential ID, work uniforms and much more. All of this will directly help to give vulnerable local people the specialist, holistic support they need to break the cycle of homelessness. We at OxPAT are thrilled at the generosity shown by the public in supporting the Christmas Match Campaign which was initiated by Oxfordshire Community Foundation (OCF). We are also grateful to the Oxford Mail for helping us to publicise the campaign. Between 10 December 2018 and 6 January 2019 OxPAT raised £42,833.13 mainly from donations by the public. This was matched by OCF, resulting in a grand total of £85,666.26 to be distributed to the nine charities which OxPAT has been supporting over the past year. The nine charities are listed on our what we do page, and all of them do excellent work directly with people who are homeless or vulnerably housed in Oxfordshire. They have each now received over £9,500 to help them in their work. From Crisis Skylight Oxford: We helped one client find a job and then paid for his bus fare to travel to work. He had been sleeping rough in a field since his live-in job ended and he lost his accommodation. We also paid for him to stay in the Backpackers Hostel so that he could get a good night's sleep and a shower before work. He is still in the Backpackers but is now working with Will, one of our Housing Coaches, and it looks like he will be in accommodation soon. From The Porch: Paid for coach travel from Oxford to Scotland so a rough sleeper could get to a job there. We also arranged hostel accommodation near the new job and confirmed it with his employer so that he could be taken on (it was a kitchen job in a restaurant). From Emmaus: Purchase stationery for a Companion to do a weekend course at Ruskin College. Also paid for this Companion's travel to make arrangements for his new accommodation. For more stories about how your money helps homeless people, keep an eye on our news page. 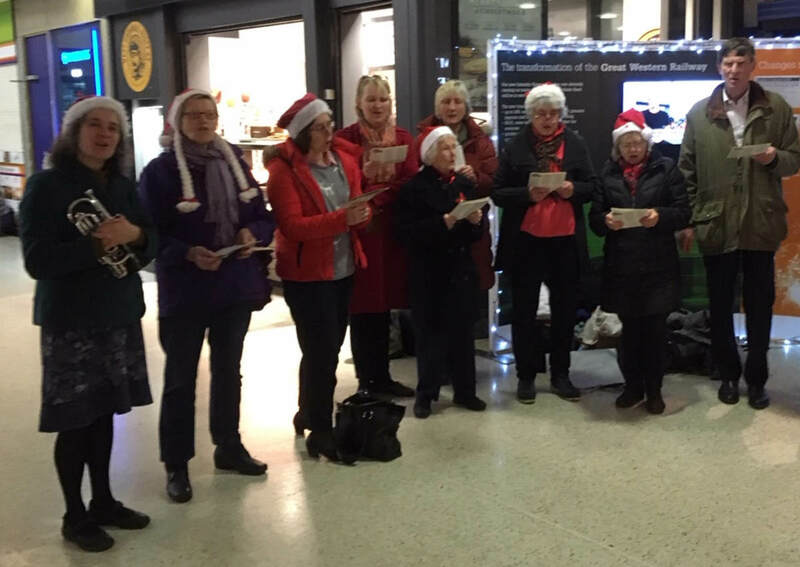 Thank you to the Appleton choir organised by Trish Wagstaff, the staff of GWR at Oxford Railway Station, and the general public who very kindly donated over £500 during the evening of Thursday 20 December. All the money collected will benefit homeless or vulnerably housed people in Oxfordshire.